The Emperor Kameyama, who became a priest at a detached palace in 1289,became the Grand Emperor. 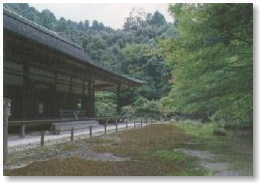 He contributed the detached palace, which became a Zen temple. Daimin-kokushi was the first chief priest of it. This place is ruinsof the detached palace and also the cradle of the Nanzen-ji Temple. The garden remains traces of its former shadows. This is the typical garden made at the end of the Kamakura Era, where you can walk around the ponds and springs here and there in the background of deep, green forests with profound and quiet elegance. The man who made this garden is said to be the Grand Emperor Kameyama. This garden is specified as one of the three scenic and historic spots in Kyoto City. It is on your left hand that you can see stone constructions of Takiguchi. The upper pond you can see is shaped as a form of a dragon, and is called "Sogen-ike Pond", which has "Horai-sima Island" in the center of it. The down pondhas an island whose shape is just like a Japanese letter , meaning heart. According to the records, when the garden was first built, cherry trees were transplanted from Yoshino, reeds from Namba, maple trees from Tatsuta, and even frogs were loosed off from Ide. The "Hojo" in the Nanzen-in Temple was rebuilt as a contribution from "Keisho-in", i.e., the mother of the Shogun Tokugawa Tsunayoshi. The features ofit lie at "hinoki-zukuri" (made of Japanese cypress) and "Irimoya-zukuri" (one of the typical Japanese carpenterings) and kokera-buki (Japanese style roofs made of numerous, small tips of Japanese cypress). You can see the wooden statue of the Grand Emperor Kameyama (one of the Japanese treasures) in the center of the "Naijin" place. The pictures on the "Fusumas" (sliding doors) are black-and-white paintings by Kanoh Yohboku and hisson Nyokawa Zuisen. At the outskirts of the garden, you will find the "Byoh" (i.e., a Japanese type of a mausoleum), where the remains of the Grand Emperor Kameyama were buried according to his dying wishes.